Kent Hovind is out of prison, and seeing as he has a month of home confinement to waste time on the internet, he has been posting daily Q and A sessions on Youtube. Just e-mail him, and he’ll answer your question on Youtube. Would you say that black-backed jackals, side-striped jackals, African wild dogs (Cape hunting dogs or painted dogs) and dholes (Asiatic wild dog) are part of the same kind that includes golden jackals, coyotes, wolves/domestic dogs/dingoes, and Ethiopian wolves? Domestic dogs are basic a type of “grey wolf,” so they certainly do interbreed. One could make the case in a creationist sense that these animals are all part of the same “kind,” because a “kind” is generalized term that pretty much is based solely on whether they can “bring forth”– produce offspring. Wolves and dogs have interbred and produced fertile offspring with coyotes and golden jackals. 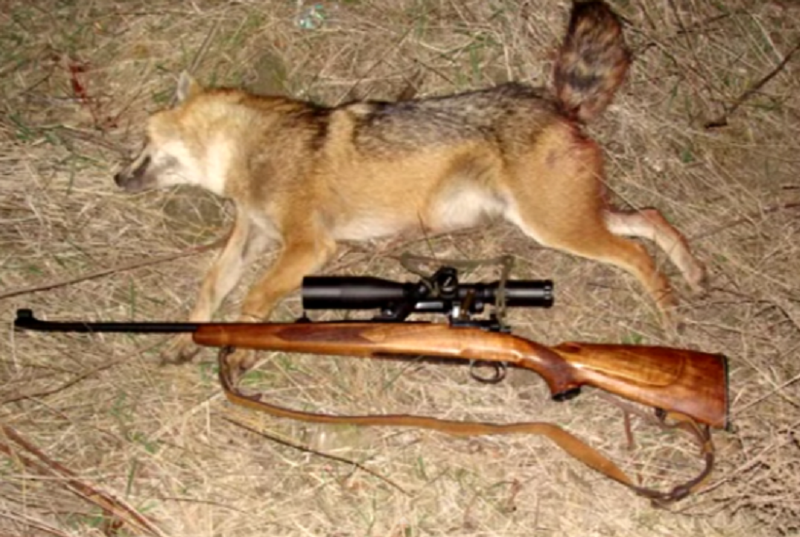 Golden jackals and coyotes have done the same. Ethiopian wolves (which are a really specialized canid that is found only in the Ethiopian Highlands) have interbred with domestic dogs, and in some instances, there have been viable, fertile hybrids produced. By the Biblical definition of kind, these animals fit. However, interfertility stops with the Ethiopian wolf. Although there are rumors of hybrids being produced between dogs and dholes and between dholes and golden jackals, we have no verified hybrids. 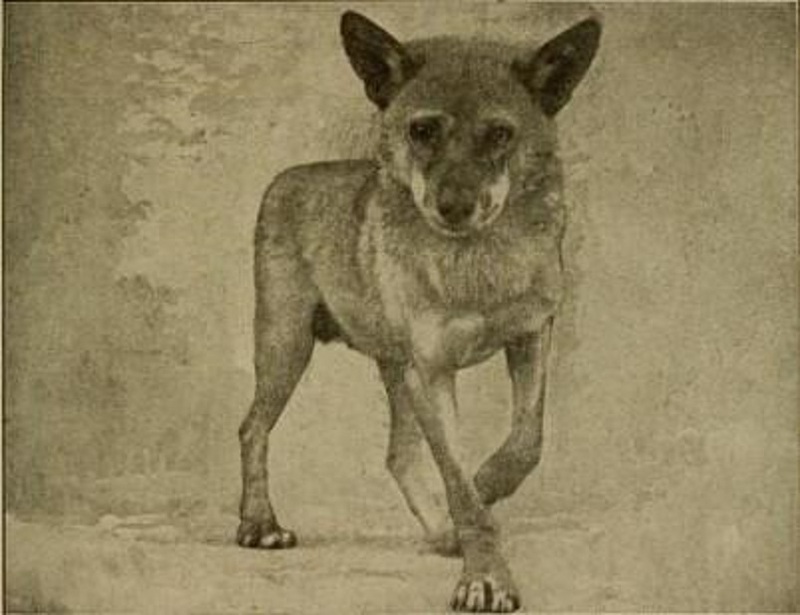 There are claims that the Bangkaew dog started out as a dhole/domestic dog hybrid, but I’ve never seen anyone confirm this ancestry in the breed. 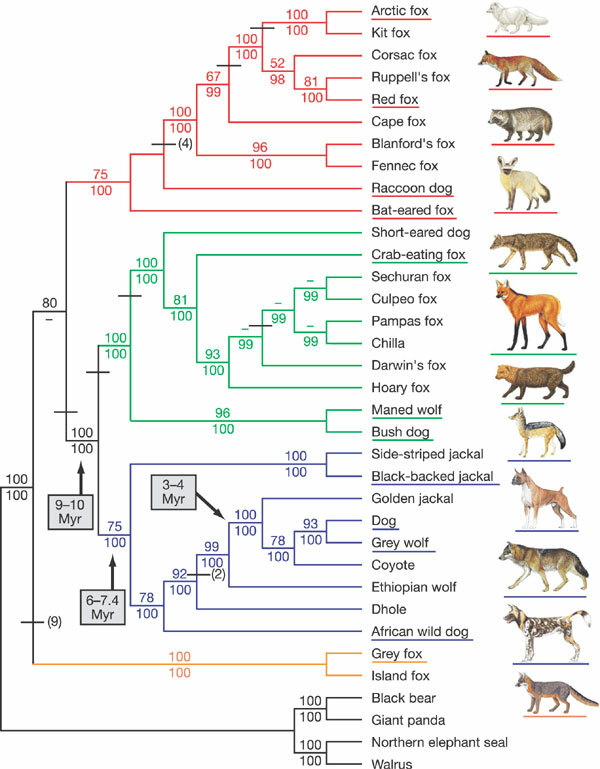 When this phylogenetic tree was drawn, it really did change the way we view jackals. When I was a kid, we tended to think of all the jackals as being closely related. We even called the Ethiopian wolf the “Simien jackal.” But even before this study came out, it was pretty clear that the canid of the Ethiopian Highlands was closer to the wolves than the other endemic African jackals. 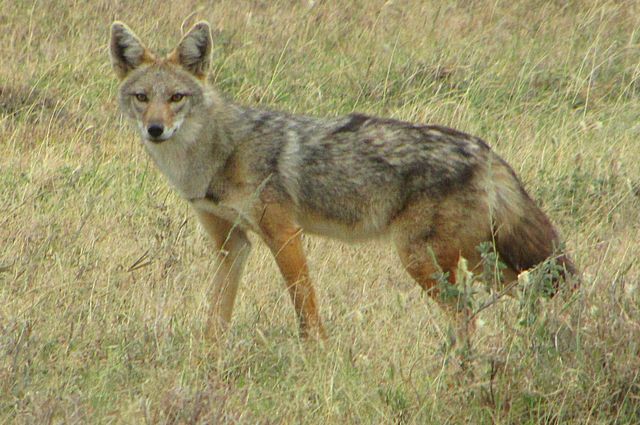 But this study revealed that golden jackals are even more closely related to wolves/dogs and coyotes than to the other jackals, and that the two endemic African jackals, the side-striped and black-backed jackals, are actually more distantly related to the interfertile canids than African wild dogs and dholes are. African wild dogs and dholes have traditionally been given their own genus names (Lycaon and Cuon), but those two endemic African jackals have always been listed as part of Canis. We now think of Canis as a paraphyletic grouping, which means it is not a clade. To make it a clade, we would have to move the African wild dog and the dhole into Canis, which is what I would do, or create a new genus for the two endemic African canids. In an earlier video, Kent Hovind was answering a question about the kinds of animals on the ark, and he said something along the lines of how jackals, wolves, coyotes, and dogs are all descended from a single dog “kind” that was put on the ark. (In that video, Hovind actually claimed that hyenas were part of the dog kind, which isn’t even close to being true). But if a “kind” is defined as what can produce offspring, we have a very hard big problem here. When a creationist says “jackal,” I don’t think they understand that the three species of jackal are actually quite distinct from each other. You cannot breed a black-backed jackal to a dog, even if people claim that basenjis are derived from them, or that they have an African village dog that looks like one. The two species are very distinct from one another. So if these animals all are distinct kinds, then God had Noah put several ancestral Canis-type dogs on the ark. Black-backed and side-striped jackals probably can interbreed, but their genomes haven’t been studied in the interfertile Canis species have been. So that would be a kind. Dholes and African wild dogs probably can hybridize as well, so that would be another kind. And then you’d have the classic “dog kind, ” which has all the wolf-like species that hybridize a lot. So we’d have these three separate kinds, but why? Wouldn’t an intelligent deity just want one dog kind? I mean, a Western coyote and a black-backed jackal are essentially the same organism in terms of their behavioral ecology. They hunt small animals. They gang up and hunt ungulates, and they do a lot of scavenging. They both have intense pair bonds, and they do cause problems with livestock producers. Why would there have to be two separate “kinds” for this mid-sized, generalist canid? Well, Hovind tried to answer my question, and he did very poorly. Now, I must confess that he was answering a bunch of questions about the flat earth and geocentrism (which many of his most devout followers wish he believed in), so I don’t think he was expecting a question like mine or understood its significance. He tells me to go look up Baraminology, which I did. But when I went to Answers in Genesis, I found that they fell into exactly the same trap as Hovind. They point out that there was a discovery a few years ago that there were some “golden jackals” in Africa that were found to be a primitive lineage of wolf. Now, these are not Ethiopian wolves. People mess this up all the time. These are African wolves (Canis lupus lupaster), and they are actually pretty widespread. Populations of these wolves have been found as far from Ethiopia as Senegal, and they do cross with golden jackals there. 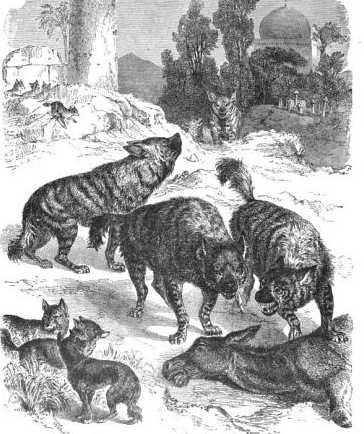 But note that the African wolves are breeding with GOLDEN jackals, and they were being confused with GOLDEN jackals. We know that golden jackals are close to wolves and domestic dogs, and they do hybridize. One could make the case that golden jackals are part of the same “kind” that includes dogs, coyotes, and wolves, but you cannot say that black-backed and side-striped jackals are part of this same kind. They no more can cross with dogs than they a dog can with a petunia or a guinea pig. So if you hear a creationist talking about jackals being part of the same “kind” as domestic dogs, just ask them about black-backed and side-striped jackals. They don’t understand the problem with their reasoning at all. AronRa has a nice video on canid evolution, though I do have few quibbles about it, such as the location of where dogs were domesticated and the size of some borophagine dogs, it gives you a good understanding of the problem when creationists mess around with interfertility in dog species. Melanistic golden jackal and normal-colored mate.. Photo courtesy of Can Bilgin and Hüseyin Ambarlı. Melanism in dogs, wolves, and coyotes has been a source of great interest to molecular biologists in recent years. For example, it has been confirmed that black coyotes and black wolves in Italy and North America gained their black coloration through cross-breeding with domestic dogs. But domestic dogs have two variants of melanism. The most common form– and the type found in Italian and North American wolves and coyotes— is inherited via dominant allele. But there is another form, which is related to the sable coloration, that is inherited via a recessive allele. This recessive black may have been indicated in at least one Russian wolf, but all modern black wolves that have been examined thus far have turned out to be dominant blacks that inherited their black coloration from the introgression of domestic dog genes. However, a recent discovery of a black golden jackal in northeastern Turkey might be the first example of a melanism in an interfertile Canis species that did not originate in the domestic dog. Between February 2009 and April 2010, a camera trap near the city of Artvin captured images of this black golden jackal and its normal-colored mate. 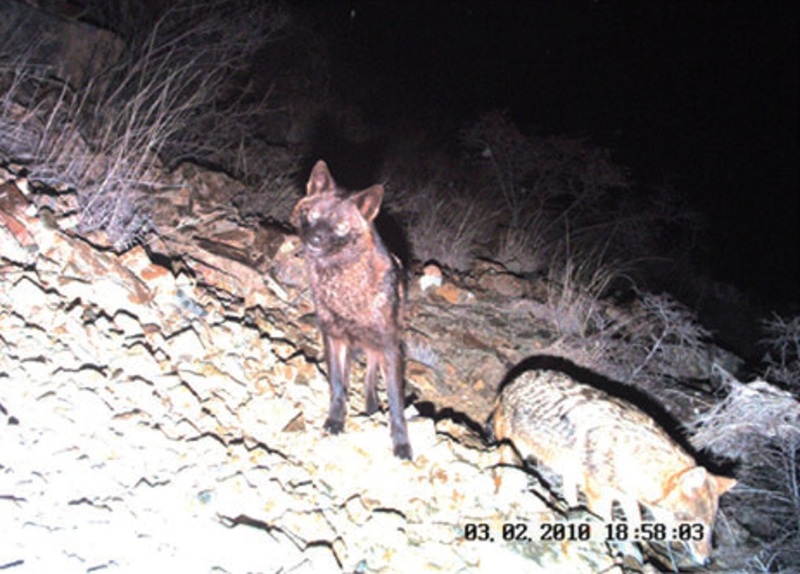 The documentation of this jackal appears in the journal Mammalia in December 2012, and the authors suggest that this jackal likely did not receive its black coloration from its ancestors crossing with domestic dogs. Although golden jackals and domestic dogs are interfertile, cross-breeding between them in the wild has not been documented– though it certainly is possible. The black coloration in red foxes is entirely unrelated to any of the black coloration in domestic dogs, and it is likely that this black jackal is the result of an entirely different mutation that has not yet been documented. Unfortunately, no physical samples from this jackal exist, so we cannot know for certain what genetic mechanism made this jackal black. 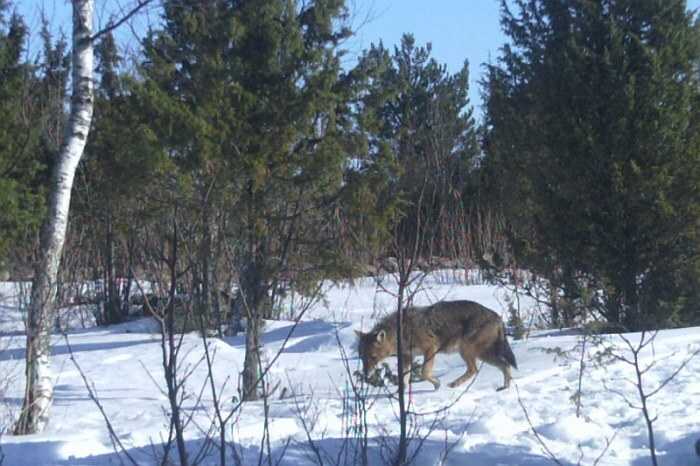 As far as I know, no further black golden jackals have been documented in the area, so this individual either left no offspring or it is inherited via a recessive allele– and thus different from the dominant black in wolves and coyotes.